EP120 in de dagen voorafgaand aan Flying Legends 2011. De kleuren zijn die van 402 Squadron, zoals gevlogen door S/L Geoff Northcott, de CO van 402. Built at Castle Bromwich as LF.Vb, construction number CBAF.2403. To 501 Sq on 040642, serving until 0942. To 402 (winnipeg Bear) Sq (0443). Damaged in a landing accident in 0244. 53 OTU (1044), serving until 0745. To No. 4 SoTT, RAF St. Athan in 0645 as instructional airframe, serial 5377M. To RAF Wimslow as gate guard in 1955 with maintenance serial 5377M in place of serial EP120. In light grey (?) overall finish. To RAF Boulmer as gate guard in early '60s until 1968. In two-tone RAF c/s, but uncoded (as noted in 1963 and fitted with 4-bladed propeller). A/c probably restored/repaired with parts from TD135 (located at that time at the dump at RAF Dishforth). To RAF Henlow for use in the Battle of Britain movie. Used as static airframe in Battle of Britain movie production. To RAF Wattisham as gateguard in 1970; ‘QV-H’, 19 Sq until 1989. To RAF St. Athan for storage. (8070M). 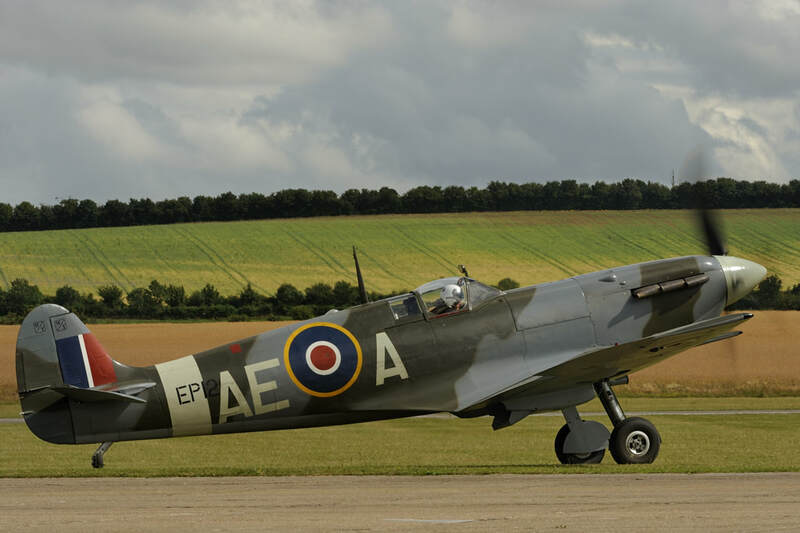 ​Sold in 1991 and transferred to Historic Flying Ltd., at Audley End for Raw for The Fighter Collection. To TFC, Duxford in 1993 for Raw. Reg. on 090594 as G-LFVB for Patina Ltd., Duxford. Noted stored at Audley End in 0694. Ff 120995 from Audley End by Charlie Brown. ‘AR3185/RF-M’, Pearl Harbor film in 0900. ‘AE-A’, 402 Sq, a/c of S/L Geoff N­orthcott (CO). Aw with The Fighter Collection; last noted 150718. Spitfire a look back over the gate, Ray C. Coulson (1994)own publication.